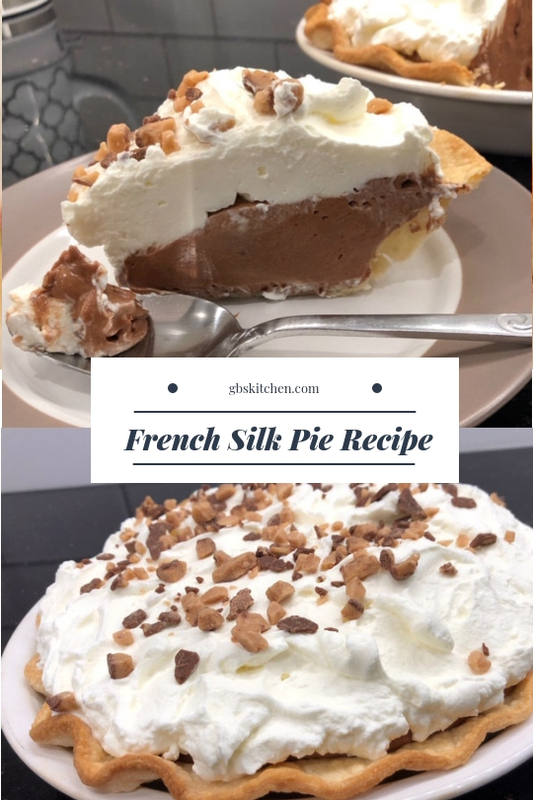 Is French Silk Pie really French? No!! It’s as American as can be. French silk pie is not filled with a pudding, but instead a chocolate mousse consisting of eggs, chocolate, sugar, and butter. (The four basic food groups for dessert!) The name is perfect because this pie really does have the texture of silk, and what decadent, chocolatey silk it is! 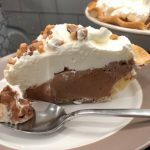 French Silk Pie was “born” in America when Betty Cooper won with an “Ice Box” pie in 1951. Another throwback! I’m in love with the old recipes, how about you? And, I’ve gotta love the originator was a Betty and that the recipe is exactly as old as me!! I wonder if her grandkids called her GB too? I adapted the recipe I’m sharing here from one of America’s food queens, Ree Drummond, the Pioneer Woman herself. I made my first French Silk Pie just a few days ago when a charming young couple I love requested it for dessert! Here’s the recipe! I hope you love it as much as they did. This pie is rich and decadent. The filling is not a pudding but a silky smooth mousse smothered in sweetened whipped cream and polka-dotted with milk chocolate toffee bits. Fit for a king or queen! The characteristic texture of this pie can't be hurried. Don't try it if you don't have an hour or so to spend! You will want a stand mixer because the mixing time is long! Please don't cut and run yet! Stay with me. The results are soooo worth it!! Go stick the mixing bowl and whisk beater from your stand mixer in the freezer before you begin. Everything needs to stay cold. This pie is so awesome I gave myself permission to cheat and use a premade crust! Roll out and fit pie crust to 9" pan, flute edges and bake according to package directions. Don't prick crust, don't over bake. Set aside to cool. In small microwave safe bowl, break baking chocolate into squares and melt for about 45 seconds until it's just easily stirrable. Set aside to cool. Now, grab that bowl and whisk beater. Slice up the cold but somewhat softened butter into it along with the sugar. You may want to wrap a kitchen towel around the mixer bowl until butter gets softer but keep beating until it gets fluffy, then add vanilla and drizzle cooled chocolate over the sugar/butter mixture. Keep beating until well blended, scraping down sides of bowl often. Now, here's where patience pays off. Put one cold egg in with chocolatey mix and beat for 5 minutes on medium speed, stopping once or twice to scrape down sides. I set the timer for this! Now do it again, one egg at a time. Beat each egg in for 5 full minutes. This is where the silky texture happens as the sugar is dissolved. No skimping here. Now scrape every delicious bit of that fabulous filling into the crust, smooth it over and put in the refrigerator for two hours or more. Pour cream and powdered sugar into chilled mixing bowl and beat until stiff peaks form. 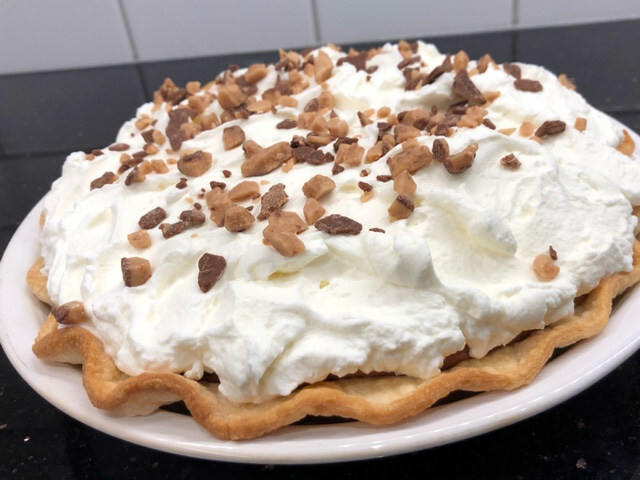 Slather thick layer of the whipped cream onto chilled pie and sprinkle lavishly with toffee bits. Serve with a flourish, you've given birth to a beauty. Stand back and bask in compliments. I was so proud to deliver this beautiful pie. It turned out great even though I’d never made one before. Nothing about it is hard or tricky, the only thing you need to remember is to bring along your patience when you make it!! How can you eat raw eggs? If you are concerned, pasteurized eggs are available. The folks at our largest grocery store tell us the eggs sold today carry very low risk. Your choice! Thanks- sorry for the frustration though! Thanks, how nice of you! Ha! and thanks! Time will tell I guess! What is your blog? I think so but would like to see. Thank YOU for taking time to comment! I sincerely appreciate it! I was extremely pleased to find this web site. I wanted to thank you for your time for this particularly wonderful read! !